"The deep ocean is one of the last great wildernesses. Waters deeper than 1000 m cover an estimated 62% of the planet. In spite of more than 150 years of exploration, the ocean depths remain virtually unknown. Biological science has so far touched upon only one millionth of the deep-sea floor, but new technology is revealing unknown and exotic habitats as quickly as we look. Those technologies are also bringing the deep within reach of industry, with devastating consequences" (Callum M. Roberts, 2002, Trends in Ecology and Evolution). 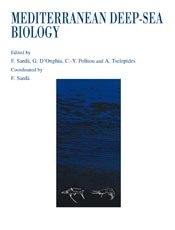 This volume compiles a series of articles that aim to give an overall view of the Mediterranean deep-sea biology related to distribution, biology and ecology of meiobenthos, macrobenthos and megafauna. Its basis arise from the DESEAS project ("Exploration survey to collect data of the exploited and virgin stocks of the deep-sea shrimp A. antennatus, of interest to CFP", EC Study contract 2000/39, Final Report 2001). The main objective is to join the most recent works conducted in the deep-water of the Mediterranean, reviewing the specific matter and the available information as well as indicating that the present knowledge on the deep-sea fauna is still fragmented. In this context a relatively large introduction on geology, hydrography, benthos and fishery has been presented. Moreover, in order to put together the majority of recent available information on the deep Mediterranean and accomplish the general scope of this volume, other papers of high interest have been included. Thus, we believe that in addition to the scientific contribution presented, this book might be used under an educational approach and might assume a stimulating role for future studies and research in the deep-sea.